Posted a new tool on the site. AppPrint scans IP range, IP or host for Web and Application servers. It scans port 80 for a particular target and tries to deduce the banner using httprint methodology. This gives best guessed banner for Web Server. In next step it uses method of forced plug-in invoke and scan for application server type. At this point it tries to fingerprint Tomcat, WebLogic, WebSphere, Orion, ColdFusion and Resin. It requires .NET framework installed. In future version we will build several other technology mapping and fingerprinting technologies like Ajax, RIA, Flash, Laszlo etc. 1. How to build simple rules using method and class signatures to identify possible weak links in the source code. 2. How to do source code walking across the entire source base to perform impact analysis. 3. How to use simple tool like AppCodeScan or similar utility to perform effective source code analysis to detect possible vulnerability residing in your source base. 1. Parsing of code is changed and now tool shows line number where pattern is found in both scanning and code walking functionality. 2. There were some bugs which are fixed to do recursive three layer scanning. SOA, RIA, and Ajax are the backbone behind the now widerspread Web 2.0 applications such as MySpace, GoogleMaps, and Wikipedia. Although these robust tools make next generation web applications possible, they also add new security concerns to the field of web application security. Yamanner, Samy and Spaceflash type worms are exploiting “client-side” Ajax frameworks, providing new avenues of attack and compromising confidential information. Portals like Google, NetFlix, Yahoo and MySpace have witnessed new vulnerabilities in the past. These vulnerabilities can be leveraged by attackers to perform Phishing, Cross-site Scripting (XSS) and Cross-Site Request Forgery (XSRF) exploitation. 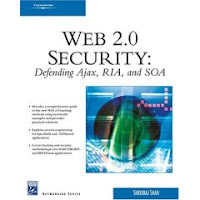 Web 2.0 Security: Defending Ajax, RIA, and SOA is the book to cover the new field of Web 2.0 security. 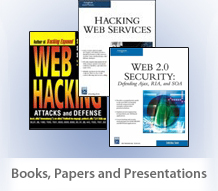 Written for intermediate-to-advanced security professionals and developers, the book explores Web 2.0 hacking methods and helps in enhancing next generation security controls for better application security posture. Readers will gain knowledge in advanced footprinting and discovery techniques, Web 2.0 scanning and vulnerability detection methods, Ajax and Flash hacking methods, SOAP, REST and XML-RPC hacking, RSS/Atom feed attacks, fuzzing and code review methodologies and tools, tool building with Python, Ruby and .NET, and much, much more. The book includes a companion CD-ROM with tools, demos, samples, code, and images. Going to talk on following: Web 2.0 applications are on the rise and as Gartner has predicted by end of 2007, 30% of applications would be running with Web 2.0 components embedded in it. This change in scenario would provide various different entry points and security holes for attackers. Hacking Web 2.0 is the most required skill for security professionals to identify vulnerability and associated threat before an attacker exploits it. New attack vectors are on the rise like two way CSRF access, XSS through JSON, JS-Object, XML and Array streams, Client side eval() exploitations, XPATH injection, WSDL scanning, Web Services payloads through SOAP and REST, XML-RPC method exploitation etc. One needs to do both scientific and artistic analysis of application to identify these vulnerabilities and this talk will cover these emerging attack vectors with plenty of demonstrations and tools. You will take home thorough knowledge about Web 2.0 hacking and would be in position to apply at work immediately.